This summer (2016), at the Portsmouth Athenaeum, I am curating an exhibit on John Mead Howells' book Architecture of the Piscataqua. 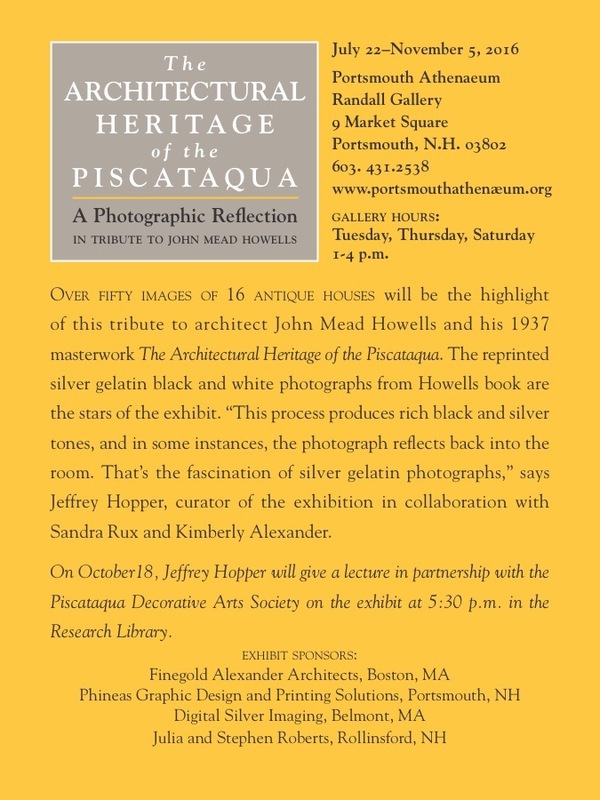 The Howells family has been instrumental in the historic preservation movement of the region and it seems fitting as the city of Portsmouth, NH approaches its 400th anniversary to reflect on the book that figured so prominently in this historical stewardship of the city and region. It has been nearly eighty years since the publication of The Architectural Heritage of the Piscataqua by the architect John Mead Howells. This summer’s exhibition is a photographic reflection of the book and the houses that inspired Howells to record them for posterity. 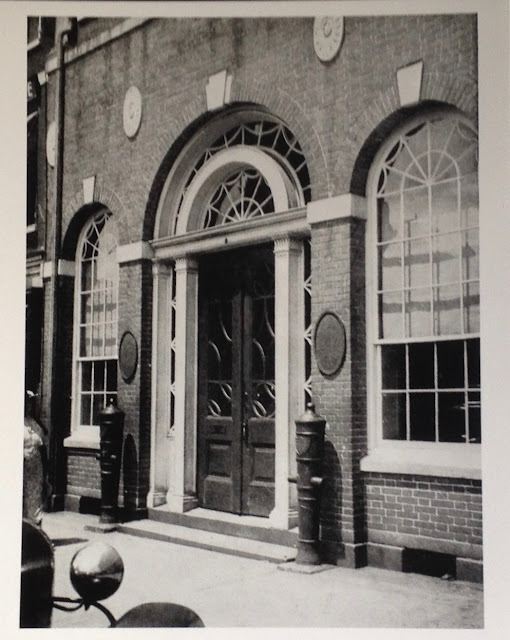 The twentieth century proved tumultuous for the buildings and residents of Portsmouth. The 1920s saw the sale of historic interiors and the resulting destruction of their edifices. The Depression of the 1930s slowed this trend and allowed Howells to photograph buildings viewed as architecturally important to his audience. 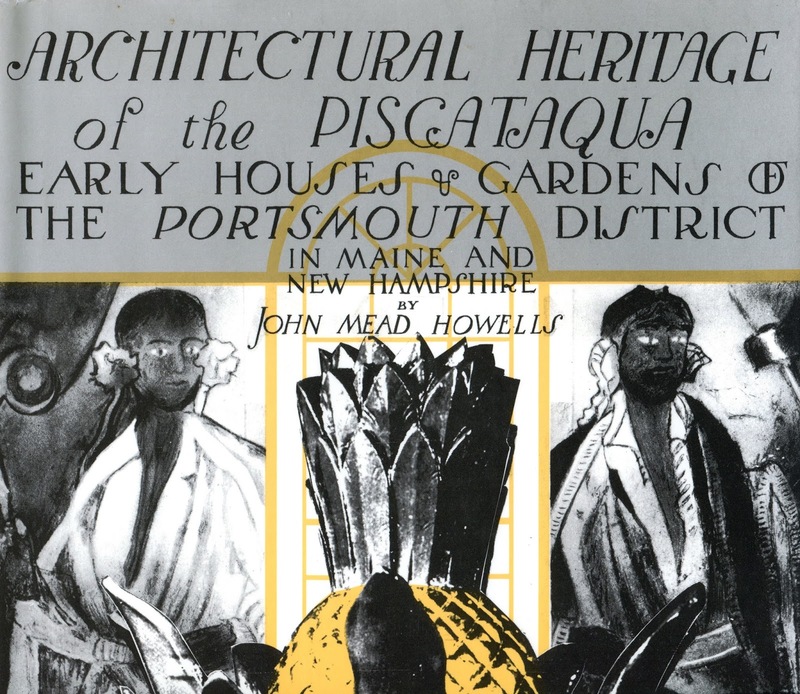 Urban renewal emerged from the victories of World War II with mixed results for the built environment and residents of Portsmouth when neighborhoods were destroyed or moved in an effort to “improve’ the living arrangements and structures of the city. 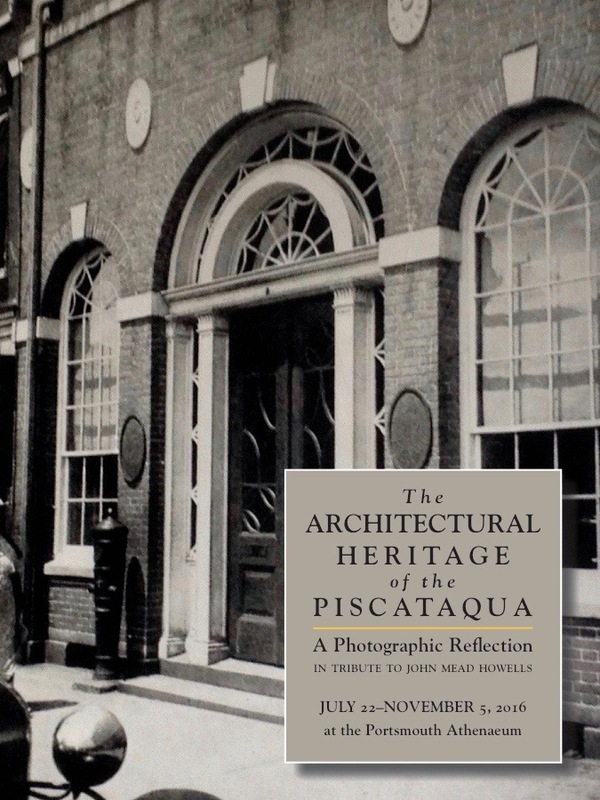 On the brink of these changes, the images in The Architectural Heritage of the Piscataqua offer a nostalgic hold on the imagination, but perhaps more importantly they provide a visual clue to the historical architectural importance of Portsmouth to the nation. William Laurence Bottomley in his introduction to the book regarded Charleston, Annapolis and Portsmouth as a trinity of eighteenth-century towns, “with much of their early work complete and extant,” but of these, he wrote, Portsmouth “was the most complete.” In 1937 this book brought that vision to the rest of the country. 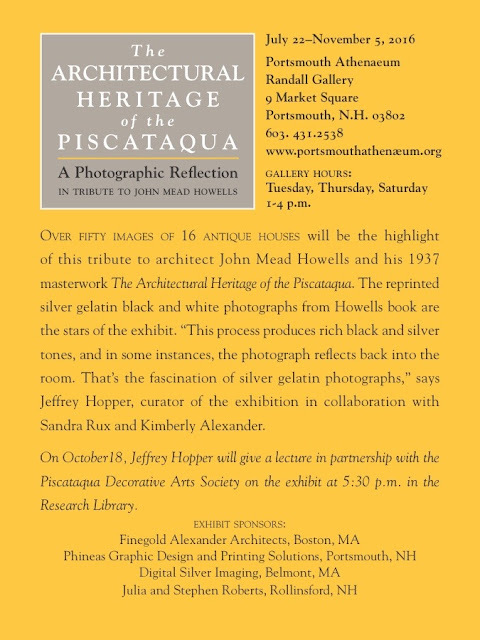 The exhibit will be open from the later part of July to Mid-November. This post was updated on August 2, 2016 with new images and an updated exhibit title—exhibits are all works in progress until they are completed. 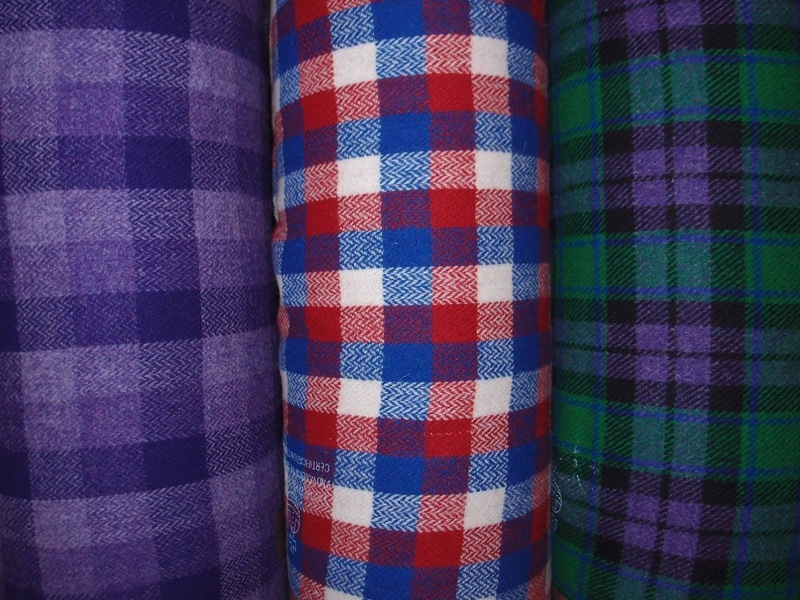 This is a personal post, an ode to the joy of tartan tweed. Three meters of Black Watch Harris Tweed from Reg Amor of Shawbost Weaver on the Isle of Lewis arrived today in the post. 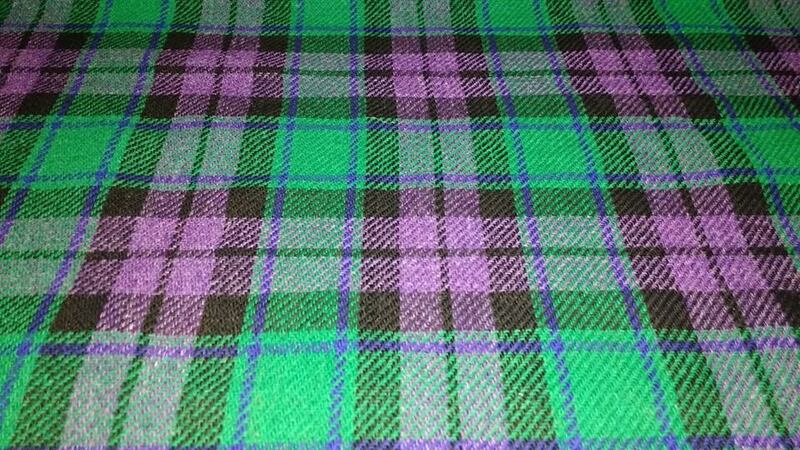 Technically I got this through Reg's Facebook page Harris Tweed-Tartan, his wife's page is Shawbost Weavers. Anyway, Bingo! Part of one meter will cover my footstool and the rest will become a waistcoat. The dogs and their black and white fur are already eying their new conquest. 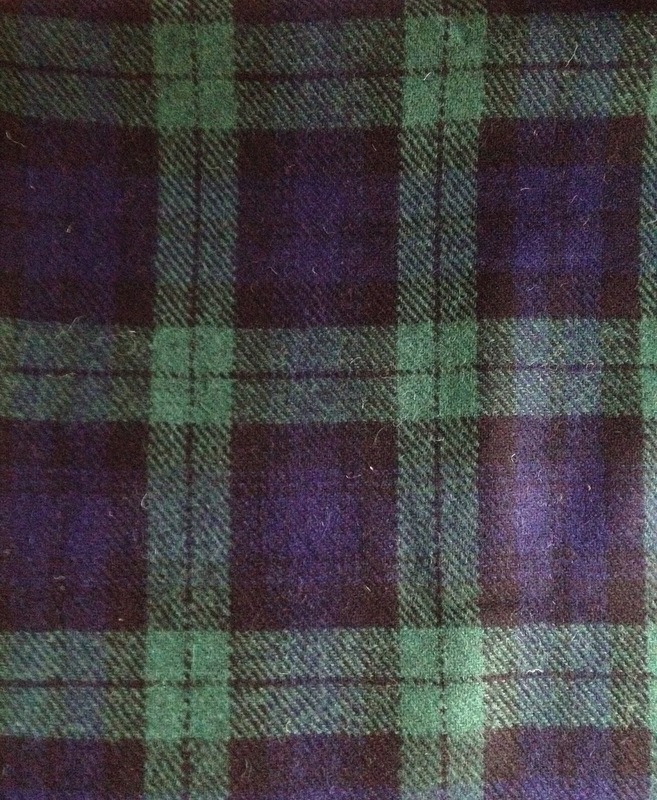 This fabric, woven on a single width loom from the 1930s, is only 30 inches wide, but that’s enough for me. To my eye and this is a truly personal observations; woven silk is like an oil painting, shimmering, luscious and the envy of all collectors; printed cotton and linen are like quick watercolor sketches, masterful tints fleeting and bold, but tartan tweed is like an engraving, an expression of straight and diagonal lines controlling the necessary color. I have a penchant for the graphic and tartans have always drawn me into their rigid lines and simplistically bold use of color—not to wax too poetically, but this is a visual journey. 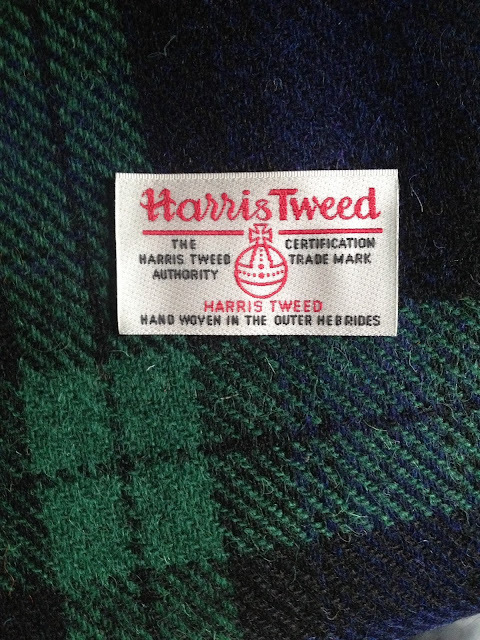 Of course because Harris Tweed is a country cloth it sits in the gods with the rest of us, but in the only available box seat, and I think that’s because it has the most character, if cloth can have character, of the tweeds. When it arrived, I grasped it between my fingers and rubbed the cloth to feel its hand, or as others might put it, its tactile qualities. 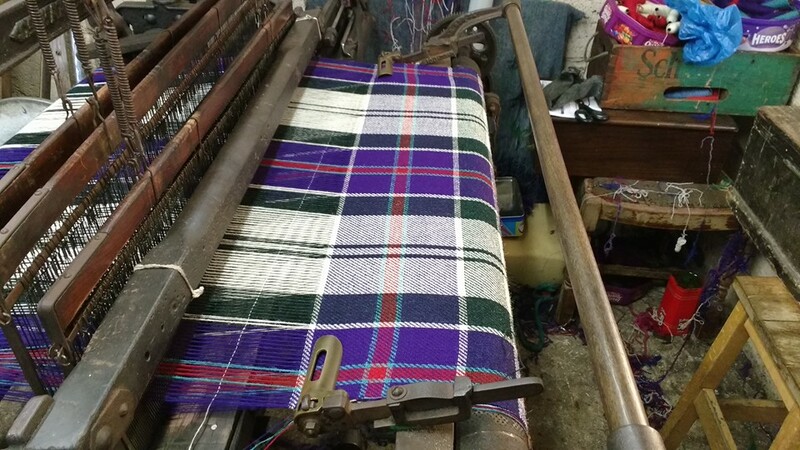 Harris tweed has a refined coarseness; that’s neither wholly worsted nor homespun. It’s finished, yet feels as if it were worn before it became anything. I have never been able to wear through this tweed and I have sold Harris Tweed jackets and a prized suit as my measurements shift. Buying this cloth is like planting a tree, it gives you immediate pleasure, but it’s really meant for future generations. I’m now going to pour a beer and privately drool over my tartan tweed, and contemplate purchasing 8 yards for a full kilt. 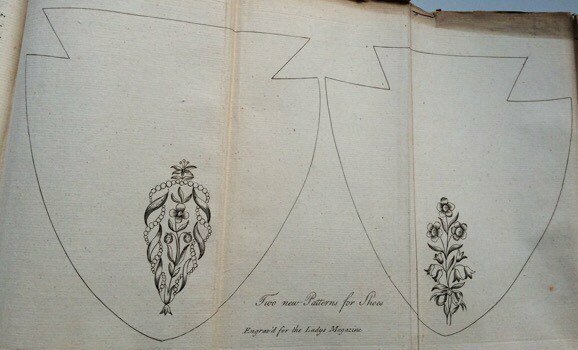 The Lady’s Magazine project (housed at Kent University) recently embarked upon a major undertaking – a stich-off! While there are many different aspects to this multi-faceted project, I was intrigued by the appearance of a 1775 embroidery pattern for shoes. 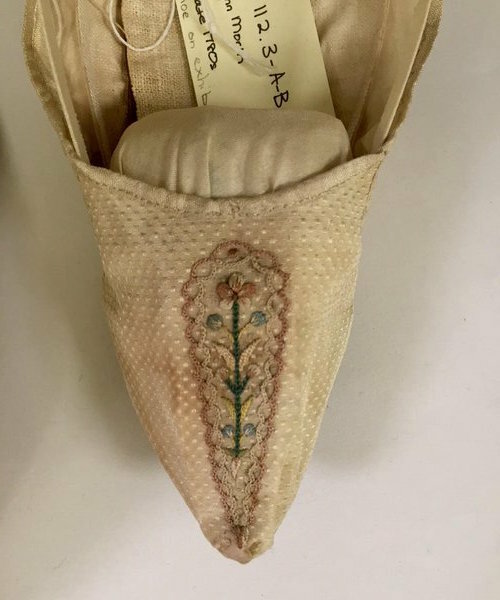 Women were creating their own uppers which were then attached to a cordwainer’s ‘leather,’ meaning his sole and heel, as well as purchasing those professionally produced. 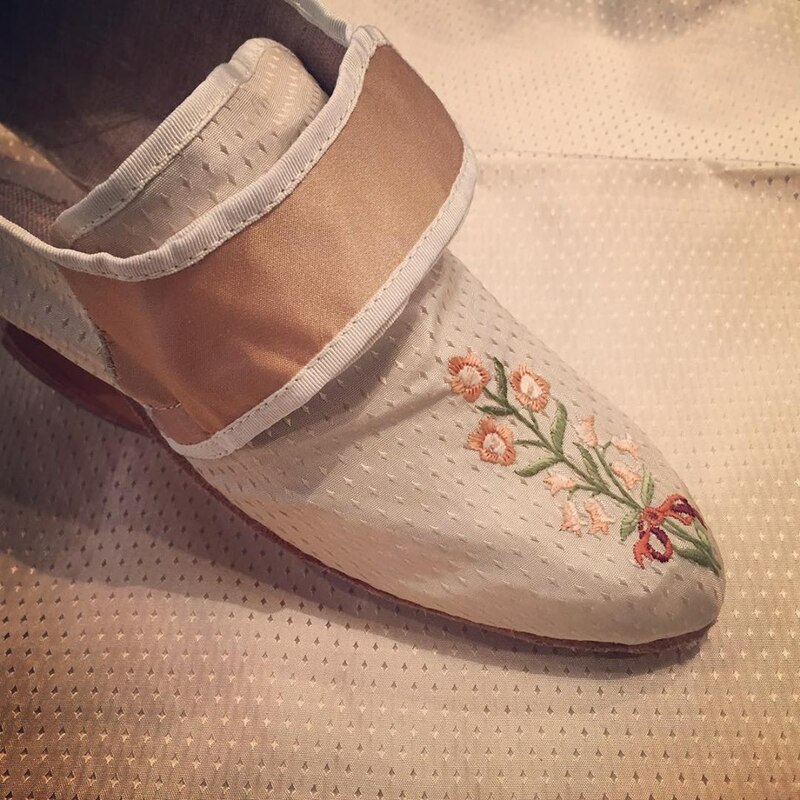 Once the generous owner of the privately held pattern made it available, the creative Dr. Jennie Batchelor threw down the gauntlet and inspired ‘stitchers” deftly created some stunning pieces. I have had the good fortune to follow the work of the talented Nicole Rudolph over the last few years (to see more of her fascinating projects, see www.DiaryofaMantuaMaker.com). When she turned her talents to the project --- well, you can see the results for yourself. 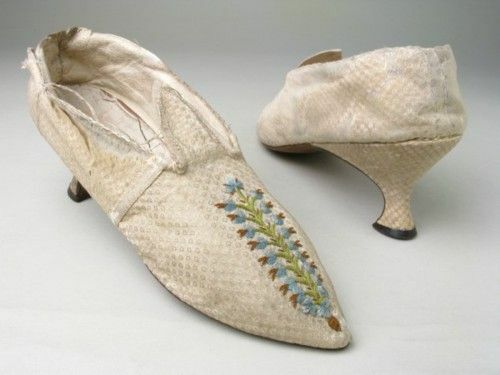 As the label notes:"These shoes have been constructed using historical tools and techniques in a style that would have been popular around 1775 when the pattern was printed. 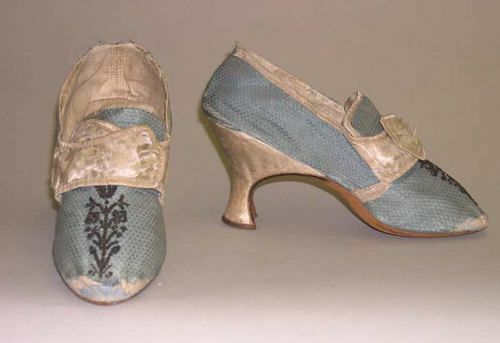 They are made from figured silk taffeta and satin, embroidered in unspun silk. 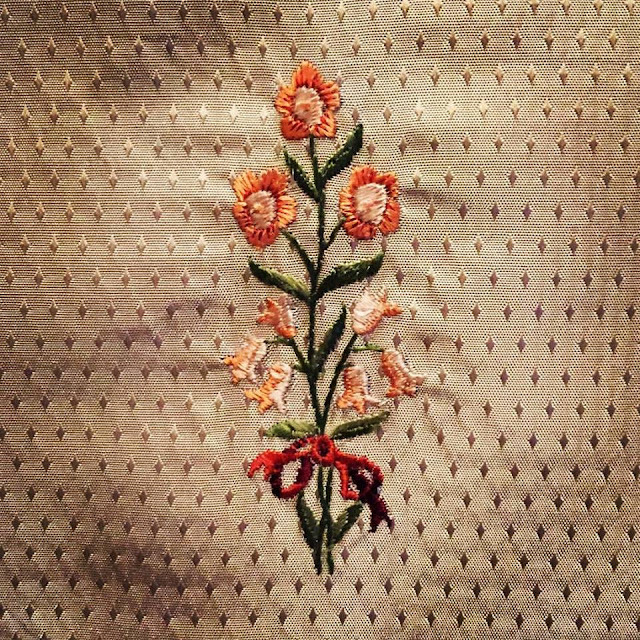 Thanks to the efforts of many, you can now view examples from the Lady’s Magazine stitch off on view at Chawton House as part of the ‘Emma at 200: from English Village to Global Appeal’ exhibition.